Ok, I have to admit that my witty little title is a rouse. This post has nothing to do with inspirational books and everything to do with actual chicken soup…for Skjalg…a medical student (hence, chicken soup for the medical student’s soul). Early this morning, Skjalg woke up with a fever and complained of nausea and dizziness. After talking a little bit about his symptoms, we agreed that it was most likely that he had the stomach flu. As he was in no form to do anything, I headed to the store to get ingredients for homemade chicken noodle soup. To be honest, if I was back in the US, I would have settled on a can of Progresso Chicken Noodle and some saltine crackers. In Norway I would have at least known where to get everything and been in and out of the store in 10 minutes (and probably $50 poorer). There are two SPAR grocery stores near our apartment: one is a smaller, limited selection version and the other, which is a couple more blocks away, is gigantic. Since Skjalg and I have only ever quickly popped in and out of the large one, I decided to turn my soup mission into a grocery store discovery one as well. I probably spent about 20 minutes studying the different aisles and their offerings. It reminded me of a time when I was visiting the US after I’d been living in Norway for two years and got stuck in the grocery store for an hour because I was paralyzed by all of the choices. I know it sounds dramatic, but if you have been to Norway, you know what I am talking about. 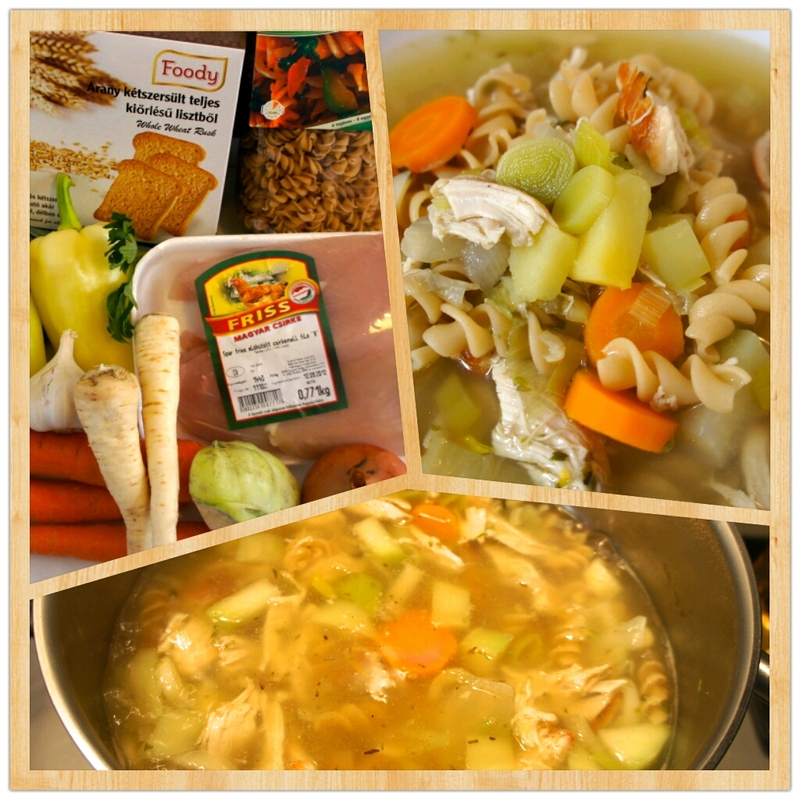 Once I had an idea of where everything was, I started getting what I needed for the soup. While choosing crackers, I encountered a little old lady who was talking to herself. One thing about Hungarians – and this is from my own experiences with every Hungarian I have met – is that they continue talking to you even after you tell them that you don’t understand what they are saying. She turned to me in frustration and pointed desperately at the top of the box of crackers in her hand. Does she want me to open the box of crackers for her…? She kept motioning to the top of the box until I realized that she wanted to know the expiration date but couldn’t read it. I communicated (somehow) that I knew what she meant and in a fluster of hand motions and broken English, explained that I didn’t know how to say numbers in Hungarian and was going to do something with my phone. She was patient as I pulled out my phone and typed in the date using the calculator function (which had large enough text that she could read it). She finally threw up her hands in relief and smiled, said something in Hungarian, and then shuffled off down the aisle. It felt good to help a stranger, even with something so small, and to have managed it without the benefit of verbal communication. Now, I’ve actually avoided getting fruits and vegetables at this certain supermarket because of something I came across in a blog. I forget where I read it exactly, but I remember the author writing of a time that the cashier had yelled at her for not properly marking her vegetables and then forcing her to leave the shop without them. Skjalg and I had a similar experience when we were in Barcelona last year. We stopped in the local supermarket to grab some food for the beach and were not allowed to buy our apples because we had not printed out a sticker and they didn’t know enough English to explain it to us. Though I’ve been avoiding the fresh produce department, I haven’t been entirely sure that they have this same “print your own label” system. (They may have this in the states now, but they didn’t when I lived there and they don’t in Norway). My fear was confirmed today when I spotted two scales attached to touch-screens. I picked out some onions and then silently studied other shoppers weighing their groceries. 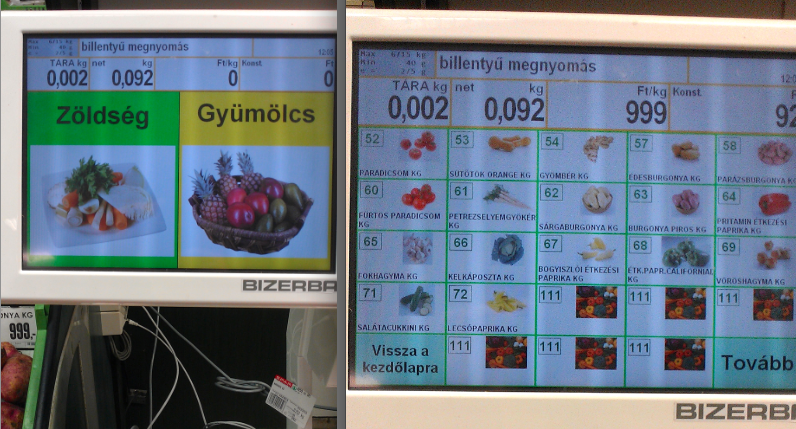 The screen showed pictures of the different items and without them I wouldn’t have gotten past the first screen: Are you weighing Zöldség or Gyümölcs? Onions…onions….onions…..there we go! Onions. I swear, nobody noticed that I had no clue what I was doing. Soon enough, it was my turn to be helpless. I had a leek in my hand and after three searches through the database, I came up empty. I didn’t want to chose the wrong label and get yelled at by the cashier, so I decided to try my luck at finding someone who could help me. Luckily enough the woman behind me in line spoke decent English and she explained to me that the leeks are charged per piece and not by weight. She went even further as to show me how I could tell which ones needed to be weighed. Success! After that it was home to make some homemade chicken noodle soup for my man 🙂 I’m a little disappointed that we didn’t get to take part in the ANSA festivities today, but also grateful to have a last Saturday to relax before school starts. It’s still the same dish. Go ahead and run a google image search. I’m not the only one 😉 Plus, chicken low-carb fusilli soup doesn’t sound as good anyway. Soup looks wonderful evem the shopping spree was a bit hard. You are currently reading Homemade Chicken Soup for the Medical Student’s Soul at Buda-B.